Golf and ski resort destination vacation rental condo in Durango Colorado. Newly remodeled condo in Tamarron Lodge that sleeps up to four people when using the loft bedroom and murphy bed on the main level. This condo is on the North end of Tamarron Lodge, which offers a nice privacy buffer from the central Lodge area and very easy access to the observation deck which overlooks the Glacier Club golf course. This updated condo has much to offer the traveler looking for a Durango vacation rental town home with golf option and just a few minutes drive (shuttle available) from Purgatory Ski Resort, surrounded by mountain scenery and conveniently located near many area attractions and activities for the best of both summer and winter fun. Arrival at this home begins with convenient 24-hour check-in at the Lodge front desk, then a very short drive to the north end of the same building and two entrance options for easy load-in of luggage and gear. Inside, guests will find updated décor, furniture and fixtures in the two-level space that includes a loft bedroom, second sleeping area on the main level, open living room, dining nook and kitchenette, plus a full bath. Cozy views of scenic woods from the living room windows create a comfortable, relaxed environment for lounging and an inviting retreat in which to return after the day’s activities. The cozy loft bedroom includes queen-size bed and mountain views and a queen-size Murphy bed folds up out of the way making more living space on the main level provides for options to sleep up to four guests. Massage and Spa treatments are available by appointment. Please Note: Please Note. Vally fitness and pool now open. Facility hours will be 6am to 10pm. Only 20 minutes from downtown Durango, CO and 10 minutes from Purgatory Resort. Enjoy skiing, snowboarding and sledding in the winter and explore hiking, mountain biking and horse back riding trails in the surrounding San Jan mountains all summer long. Take a drive on the scenic San Juan Skyway to visit Silverton and Ouray and see some of the most spectacular scenery in the country. Purgatory Resort, previously Durango Mountain Resort, is under new ownership, with the addition of new ski lift, and other guest-friendly summer and winter improvements. Enjoy skiing, snowboarding, ski biking, sledding and more in the winter, mountain biking, hiking and the Purgatory activities including Music in the Mountains music festival, Alpine Slide, Tubing Slide, mountain biking and more during the summer months. Motorcycle enthusiasts have a 100%, completely paved riding experience that includes a large, paved parking area, and this location is on the paved San Juan Scenic Skyway, which offers a popular scenic drive for motorists of all kinds. Serious road cyclists with find the paved highway north to Silverton or south to Durango to be scenic and challenging routes. Mountain bikers have many choices of trails that allow bikes, and hikers are minutes from a vast array of high mountain hikes. Horseback rides and more await summer visitors, and this townhome is a very convenient location to winter activities including skiing and snowboarding at Purgatory, snowmobile tours in the high country, cross country skiing, horse drawn sleigh rides and more. Gamble Oak and Ponderosa Pine surround the home, and the nearby hills are covered with aspen trees, making a most spectacular site for fantastic views during the golden fall color of autumn. 24-hour check-in at Lodge front desk. Interior hallway entrance. Full access to entire townhome, free outdoor parking lot, community hot tub, lawn with picnic table lawn chairs and grill. 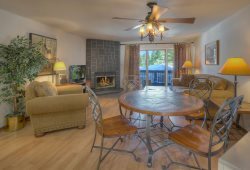 This townhome is conveniently located between Historic downtown Durango and Purgatory Ski Resort (formerly Durango Mountain Resort), close to the high mountains and is on the scenic San Juan Skyway driving loop.